When is the Right Time to Close Our Doors? We live in anxious times, and one of the things that makes small congregations especially anxious is the fear that they might need to close. As members watch their Sunday morning worship attendance dwindle, someone usually starts “running the numbers,” trying to determine how long they can continue before the money runs out and they’re forced to close. There’s another way to look at the end of life as we know it, at least for congregations. Rather than making decisions out of anxiety and a sense of ever-diminishing options, what if we could operate instead out of an ongoing awareness of God’s blessings and an eager curiosity about how we can still multiply them, even as we close? For example, I’m aware of a congregation that continued to write checks to the pastor, knowing that he would not cash them, because they were not ready to admit there was no money in the bank. What if, instead of continuing to spend up to and past the point where everything was gone, the congregation had decided to stop when there was still enough money to provide a severance package for every employee? Their last dollars would have been an unexpected blessing rather than a series of bad checks. Another congregation was required to close when the judicatory realized that the board had not met because no one was left who could serve. What if, instead of waiting until the congregation had turned to dry bones, the congregation had decided to stop when it still had enouth energy to celebrate its history and accomplishments? The last bit of energy could have been spent on festivities rather than on guilt. I’m working with a congregation whose building is in a sad but familiar state—water damage, peeling paint, worn carpet, falling ceilings, crumbling sidewalks. Its members have hung on and done their best, but eventually there weren’t enough resources to keep everything repaired. What if, instead of letting the building crumble, the congregation had decided to stop when it was still in good condition? They might have sold the building and converted their biggest asset into cash to endow their favorite missions. This same congregation was intentionally located, 125 years ago, in a working-class neighborhood, but the neighborhood has gone downhill in recent years. Nnow most of the homes are rental units in poor condition, and the congregation no longer feels connected to the neighborhood. They tried to work with an ethnic congregation, but the relationship didn’t last and the congregation couldn’t imagine an alternative. What if, instead of failing to find a vision for ministry in their neighborhood because it no longer fit their image of their church, the congregation had stopped before the building was too worn and looked around for someone who could hear God’s call in that neighborhood? 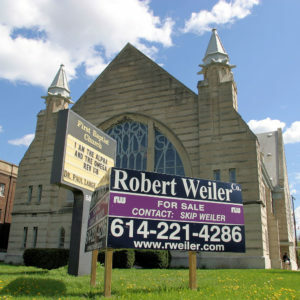 The congregation might have gifted its building and remaining assets to a congregation with a vision for the area’s renewal and rebirth. If We Can’t, Who Will? My point is simple: we should stop sooner. A few congregations may dwindle down and still find a way forward, but most congregations, like most people, come to an inevitable end. At some point, most congregations die. What if, before that happens, we find a way to give the congregation’s resources to someone else rather than hanging on until there is nothing left? What if we close when we can still celebrate rather than when we’ve been ground down by exhaustion and despair? What if we offer up everything we have as an opportunity for someone else’s new life? Wouldn’t that be a better, more faithful, more gracious way to think about closing?